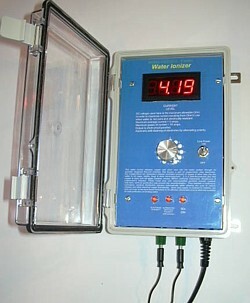 All De Luxe Commercial/Industrial Water Ionizers include a windowed plastic electronic control box, special transparent flow-cell charging chamber, in-line magnet assembly, removable set of 6″ solid copper electrodes (or pure silver or gold or zinc), Owner’s Manual, ion test kit, Installation and Pool Care booklet, and a 1 Year Warranty. Pumps, holding tanks, filters and tubing are extra. Option of 12″ long electrodes, multiple manifold chamber, UV light. Exact sizing of units may vary due to several circumstances such as temperature, climate, salinity, conductivity & pH of the water. Each has 12 levels of power control from zero to maximum. Each can have 2 copper, or 2 silver or 1 copper and 1 silver flat solid large area electrode. Our water ionizers have two similar electrodes of copper/silver alloy (pure silver for drinking water is an extra option). There is good evidence that most ionizers on the market can now be considered to be obsolete in the context of what we are offering as standard features. All of our ionizers have internationally approved supply of 24 volts (to overcome problem of non-conductive water), continuous power control over 10 levels, high frequency pulsed DC (enhances ionization) with 50 nanosecond transition rise-time, alternating switched polarity self-cleaning of electrodes, constant current (prevents burn-out of electrodes when water is very hard and electrically conductive, mounted in robust water-proofed aluminium box. Our choice of the high voltage of 24 v is necessary when the water is relatively soft, pure and devoid of minerals (low TDS) which renders the water electrically non-conductive. CONTROLLER BOX: Weather Proof Robust Solid Die-cast Aluminum with flanges for mounting. Also acts as a heat sink with no need for cooling fan. Especially helpful in hot climates. COPPER TEST STRIPS: These test for copper ppm. Available as option. INDICATOR DISPLAY :Digital LCD Display of electrical current into electrodes. WARRANTY: Three years on manufacturing defects.